Mary M. Corriveau was recently elected to the IRLC Board of Directors. She brings to the Conservancy her vast experience from various senior leadership roles in major public and not-for-profit organizations in the North Country. Her professional experience includes serving for 10 years as the City Manager of Watertown, NY. 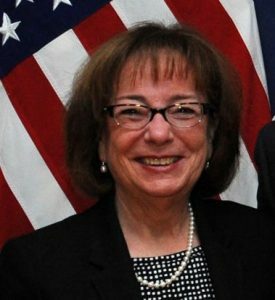 In a voluntary capacity, Mary served as a Board Member and Officer of the Fort Drum Regional Liaison Organization, Operation Yellow Ribbon, and the Jefferson Community College Foundation. She is the Corporate Membership Chair of the NNY Fort Drum Chapter Association of the United States Army. Mary is also a member of the North Country Honors the Mountain Monument Enhancement Committee, the Advisory Committee for the Jefferson Community College Center for Community Studies, and is the Chapter cofounder and coordinator of Guitars for Vets in Watertown. Mary is the recipient of the 2005 Athena Award and 2015 Shapiro Award. Mary earned a B.S. in Accounting and Law from Clarkson University in 1983 and became a Credentialed City Manager (ICMA) in 2003. Mary and her husband Jim own a cottage on Sixberry Lake where they spend much of each summer.